My recent exhibit Light Matter came down earlier this spring from Davis, California. If you missed seeing the show in person, here is a gallery walkthrough in photos. 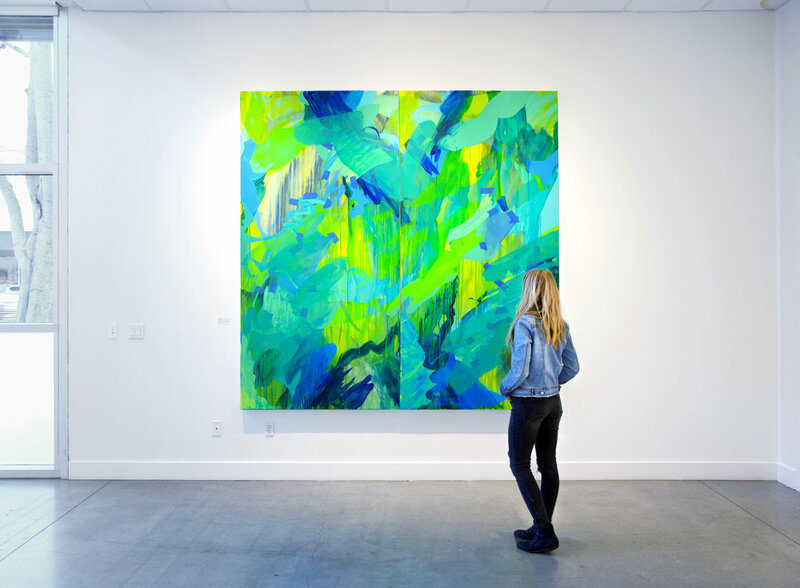 Light Matter explored ways color and light can be used to create portals and pathways, how painting can help us navigate states of flux, and how galleries can become like sanctuaries. This show involved my most ambitious installation to date, and it was such a privilege to take over the Pence Gallery's main gallery space in order to realize it. Read more on the show below. 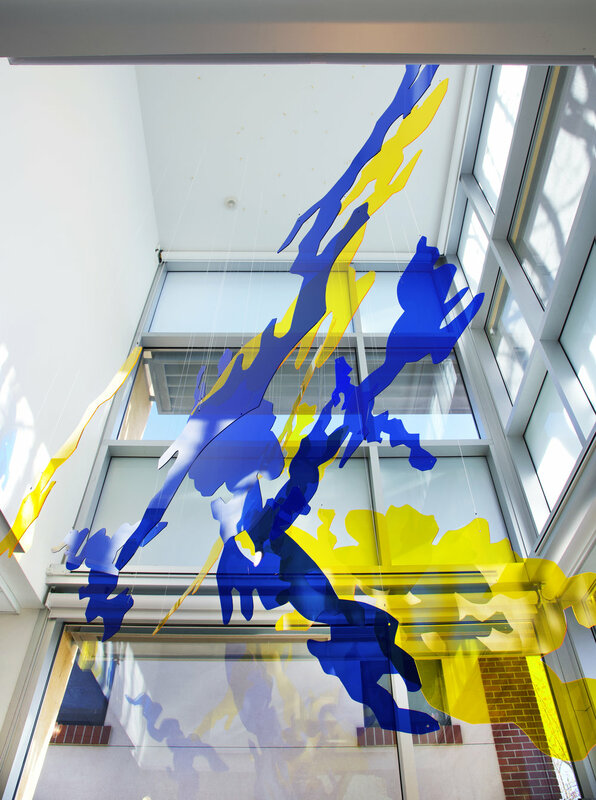 Here are some details of my piece Forming Light, a sculptural installation of blue and yellow acrylic pieces, laser cut and hung from the ceiling. 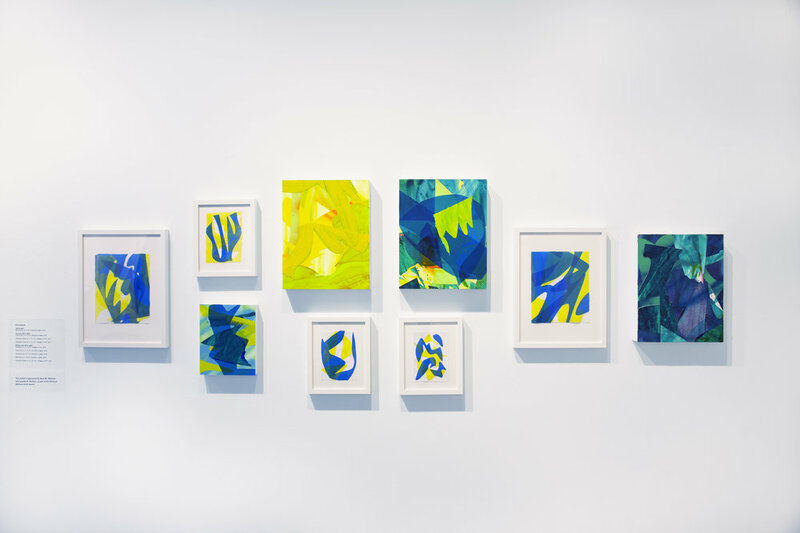 For her exhibit Light Matter, Mueller envisions the gallery as a sanctuary with colorful “stained glass” works, including an immersive window installation, collages, and vertical, window-like paintings. Mueller activates the glass tower, a prominent architectural feature of the Pence Gallery, with a site-specific installation. She reinterprets the medium of stained glass with materials such as cut dura-lar and acrylic in suspended, organic shapes that reference natural phenomena like storms and hurricanes, or the more benign dappled light that filters through the trees into the gallery on a daily basis. She brings the longstanding tradition of stained glass with its connotations of spiritual or sacred spaces, into the gallery with impermanent materials, re-envisioning the gallery as a sort of chapel. In so doing, the artist compares the role and relationship of galleries to sanctuaries, particularly how a sanctuary can offer a space for reflection and possibility. As colored light filters through to cast abstract shapes on the floor and walls, Mueller aims to give physical form to the abstract sensation of light, merge the tangible and intangible, and provide pathways for moving through liminal states that remain in constant flux. Mueller’s works are both exuberant and complex, with shifting figure-ground relationships, vibrant color, and pockets of deep space creating pathways that weave in and out of compositions both dense and open-ended. Her process-based works are painted, cut, collaged, arranged and rearranged through an additive process of layering, with the resulting works existing in a perpetual state of motion in between chaos and cohesion. In this way, she makes manifest our inner desire for work that offers us space for reflection, reminding us of our own presence—and to be present—in the midst of shifting environments, and with a perspective that ultimately, expresses hope. Light Matter was supported by the Mark M. Glickman and Lanette M. McClure Artist Award, given to emerging artists producing innovative work within California.